A 1930’s Fiat 500 Topolino, a 1940s Austin 12, a 1950s Morris Minor and a 1960s Mercedes Benz 190.This line-up of memorable automotive icons currently on display at the Alliance Francaise in Lusaka certainly sounds like what you might expect to see at a classic car show. But far from the shimmer of over-polished cars you expect to see at a vintage car show, all the cars in this venue are rusty non-runners with no tires, holes where their headlamps used to be and they are all the creation of one of Zambia’s most inventive artists, Mwamba Mulangala. In fact they are all paintings in a body of work that opened on Thursday in an on-going exhibition entitled Point Of View. 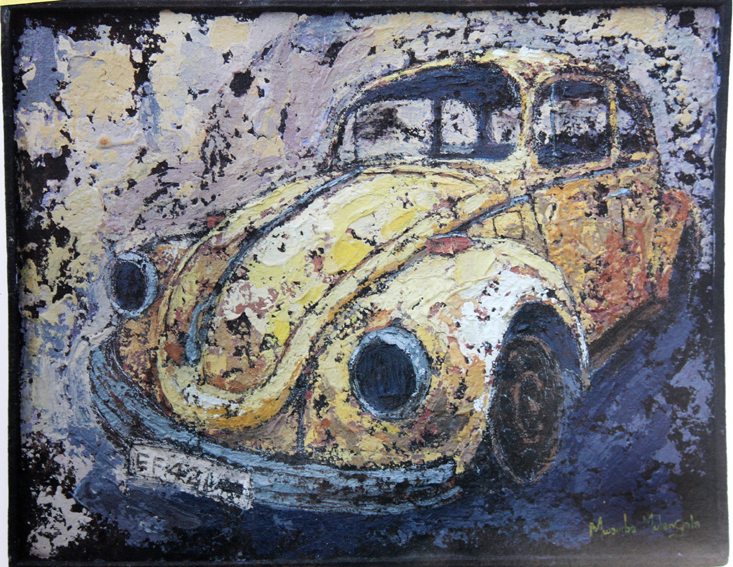 The 36-year-old has toyed with rusty old cars as subject matter since the late 1990s around the time he became the youngest artist to ever win a Ngoma Award in the Henry Tayali category at the age of 23. 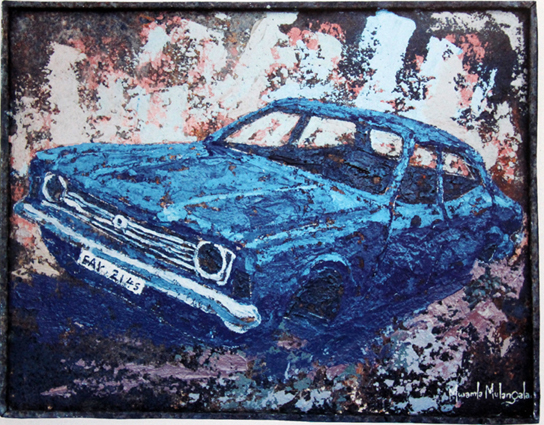 Recent development in his production is foreshadowed by a longstanding technique to mimic rust in his depiction of old cars. In his latest series however, with works simply titled Point of View # 1 and so on, he completely does away with canvas and uses actual, rusty old sheets of metal that he painstakingly collects from scrap metal dealers, competing with manufacturers of makeshift wash basins or shomekas as they are called by many township dwellers. But where his scrap metal collecting competitors, the shomeka makers make it a point to scrape off the rust, Mulangala keeps as much of it as he can giving his work a realistic, almost three-dimensional finish. And it works. The effect can be best appreciated on works such as Point of View #10 which depicts the shell of a hole-ridden 1960s model Peugeot J 7 van. “I’m very specific on the corrosion of the metal. 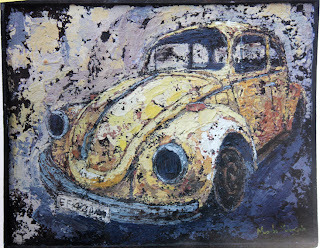 I use a different kind of acrylic when painting on rusty metal, its acrylic enamel. I want the rust to come out, to really show” he explains “On most paintings I try to make sure that I use 50 per cent rust and 50 per cent paint. For preservation I apply metal clear coating to stop the oxidation process and further decay”. 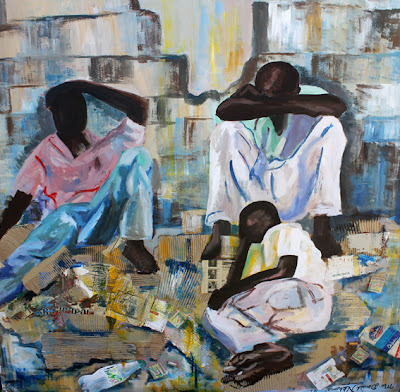 He goes on to passionately explain the text book theory of rusting metal, reminding us that besides being a professional artist, he is also a school teacher at the American International School of Lusaka where he teaches lower and senior grade art. Nevertheless, viewers must not be fooled by then artist’s outwardly innate subject matter. There is something deeper to the work. Over the years not only has he focused on exploration of material, he has also been thematically consistent on his creative quest to insightfully provoke thought. Mulangala’s cue that the cars can be the embodiment of characters or individuals we know or may have known strikes a chord with this author. Having literally grown up in a 1970’s Ford Cortina, and being driven to school every day one feels the incarnation of one’s father in Point of View # 18. Similarly, having convinced ones mother at the age of 10 to spontaneously buy a yellow VW Beetle during an afternoon stroll, yes cars were bought that easily at some point in time, one sees the embodiment of ones mother in Point of View # 7. Anyhow, as much as he too may have a Point Of View this article is not about the author, it is about Mulangala’s latest body of work. 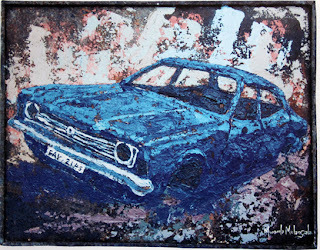 Point of View #3 should be one of the more interesting and collectable pieces of the show, because little known to many, and probably to the artist too, it is the depiction of an old car outside Lusaka National Museum which according to reliable museum staff was used by the iconic freedom fighter Harry Mwanga Nkumbula during Zambia’s liberation struggle. There is no telling what make the rusty old car that rests just next to the fence of the Government Complex is, but it looks like something out of Mario Puzzo’s The Godfather. 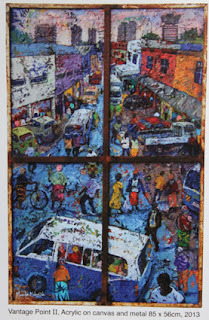 Patrick Mumba, Eddie Mumba, Flinto Chandia and Lutanda Mwamba are just a few of Zambia’s most influential painters and sculptors that will have their works on display at Twaya Art-Zambia Gallery, Intercontinental Hotel Lusaka on Tuesday, 16 April at 18:00hrs next week, in what can only be described as a small, but prestigious exhibition. Visual arts audiences can expect a rare treat when these local artistic masters' works as well as those of Stary Mwaba, Laurey Nevers-Chandia, Angela Chipanda-Ninda, Baba Jakeh, Mikiti and late Paul Kabwe open to the public for two weeks. However, collectors should leave their cheque books and wallets at home since none of the 16 works on display will be on sale because they are all part of what used to be the Embassy of the Kingdom of Netherlands collection of contemporary Zambian art that has now been donated to Lechwe Trust as part of its vast collection. The work has been collected over a period of time during the Netherlands years of operation in Zambia, and according to a report by Lechwe Trust Vice-Chairperson William Miko; the donation of the artworks was prompted by the Embassy’s proposed closure of its Mission in Zambia. And Dutch foreign minister Uri Rosenthal recently announced the closure of four embassies in African countries including Zambia as part of an effort to modernise embassy services and re-focus the priorities for Dutch foreign policy. Miko states that before outgoing Ambassador Harry Molinaar left Zambia, he had been an avid admirer of Lechwe Trust’s art collection and its commitment towards supporting arts activities. Molinaar met with Lechwe chairperson Cynthia Zukas MBE to whom he indicated his willingness to support the trust in one way or another. Molinaar later wrote to The Hague suggesting the donation of the mission’s collection to Lechwe Trust and the headquarters responded in the affirmative. As of Friday last week, all the works were taken down from the former Netherlands Embassy offices and hauled for some minor restoration activities in readiness for Tuesday’s exhibition. The suggestion of an exhibition itself was advanced by current Head of Mission/Development Co-operation Ardi Stoios-Braken and it will serve as a public hand-over event with invited guests and a guest of honour, most likely a senior government official, Tourism and Arts Minister Sylvia Masebo is a likely bet. For followers of Zambian art, this small collection does hold some historic significance. Take the sculptures for instance; they are a good example of the period in sculpture before power tools as well as the current power tools era. A small Janus-type, untitled hardwood sculpture by Paul Kabwe shows a good sample of a 1980s sculpture that was carved using in many cases homemade chisels and mallets, similar works were done by the likes of the higher-ranking Tubayi Dube and his long string of protégés. The other sculptures in the collection by Chandia, Mumba, Chipanda-Ninda and Baba Jakeh represent the power tool era. Obviously tools such as electric grinders became more easily accessible from the early 1990s onwards. 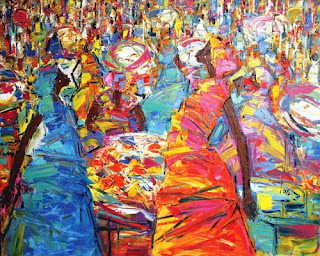 ﻿﻿Also interesting is a relatively early painting by prolific young painter Stary Mwaba which depicts a scene where vegetable marketeers have set out to order their daily stocks. The painting’s chalk-like haziness is nothing like the much collected works he is churning out today, in fact, in style it is reflective of a period when he was Lutanda Mwamba’s studio apprentice, just after the time he was ‘discovered’ in Northern Province. Speaking of Lutanda, as he is fondly called, his two works in the collection, Lifeline and Giving Life, go back to a time when the overall aesthetics of his work was merely a series of very thin lines in no more than two colours. 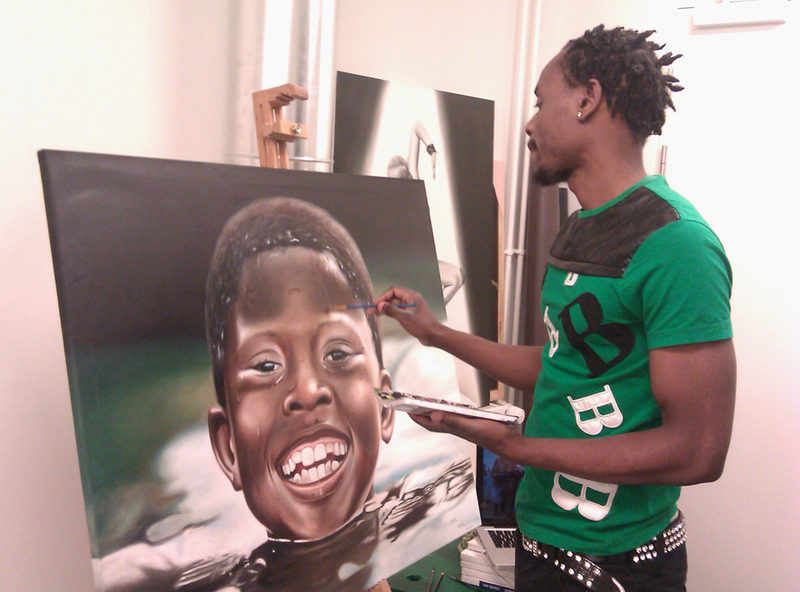 Those close to the artist attest that he stuck to this style for quite some time after he survived a shooting while attending an artist’s residency in Johannesburg. He has since changed his style many times over, but he still bears bullet wounds, and according to legend, he still has one or two bullets lodged in his chest, somewhere. The Commonwealth Foundation Fellowship laureate has flown the Zambian flag all over the world including the UK and Jamaica and has his works are scattered in collections across the globe. Nevertheless, the choice of Lechwe Trust by the Dutch could not have been any better, under the passionate leadership of Zukas MBE the Trust has for a long time collected Zambian art in an effort to keep it within her borders and at a very high cost if one might add. The works will definitely be at home among the hundreds of others collected by Lechwe over the years even if their home is still a 40 foot container. It does however raise some thoughts. Why would the Dutch opt to leave the works in the hands of a private trust that is going to box them away because it is yet to commence the construction of a gallery? Why not donate them to the government of the day for them to beautify their spaces of choice, government offices or parliament maybe? Why not ship them to The Hague as a memento from Zambia? Although unofficial, the answer to these three questions is simple. As much as Zambia may have an arts ministry, from the lowest to the highest echelons of our society we are still too aesthetically blind to appreciate art, period, and shamefully so. No matter what levels of education we attain we remain artistically illiterate, probably even our Paleolithic ancestors, the prehistoric cavemen had a better use for art than we do, so yes, why not give the works to someone who will lock them away for safer keeping until a time when they will be appreciated, probably thousands of years from now as we currently marvel when we gaze upon the prehistoric rock paintings of Kalemba in Chadiza, Chifubwa Stream in Solwezi or Mwela Rocks in Kasama, someone will one day appreciate what is today Zambian contemporary art. “Umwana ashenda atasha nina ukunaya” which loosely translates “The child that does not travel thinks its mother is the best cook” is the old Chi Bemba proverb that young painter Caleb Chisha borrows upon returning from a three month visit to Denmark. Chisha was recently in the capital, Copenhagen on a social visit whose details the painter would rather keep hush-hush but close friends suggest was facilitated by a Danish lady friend and possible sweetheart who is also a contemporary dancer. It turns out he was able to hold a spur-of-the-moment exhibition at a dance venue called Dansekapellet, the first solo of his fledgling career and he feels delighted because according to him, all went well. The artist, who was last in the press when he voiced out a concern during an exhibition in Lusaka where he felt Zambian’s of European decent only buy art from “their own kind” before he left for Europe appeared visibly motivated by his recent trip when found working on several new works at a go in his small studio space at the Art Academy Without Walls in the Lusaka show grounds. “Even though I was exhibiting at an unusual venue I think I did quite well. 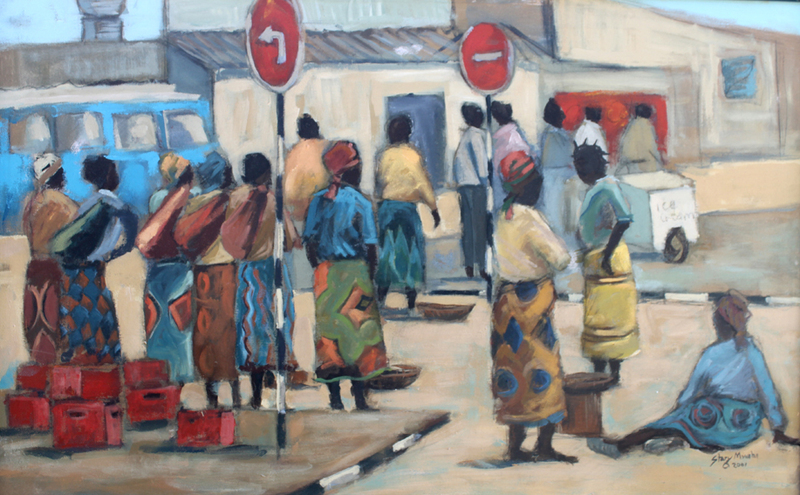 I did a total of 12 paintings while in Europe and I managed to sell four, which I think is not bad,” he says “And what was quite encouraging is the fact that I could sell a painting at up to four times of the price I sell in Zambia”. Chisha’s work averages at K3, 000 (new currency) per painting here in Zambia, so you can do the mathematics on how much he possibly made in the brief period abroad, besides, he says that he did not work for the entire three months he was there and only put in about a month’s effort, working in a small, improvised studio space that was lent to him at Dansekapellet. Dansekapellet was designed in 1908 and is formerly a final resting place for the deceased but has now been transformed into a dance venue, it is backed by Copenhagen City Council, Nordeafonden (Danish foundation) and The Danish Foundation for Culture and Sport Facilities. Chisha’s exact exhibition space was in a rotunda with a high-roofed dome, and judging by the video footage from a mobile phone, the opening evening was well attended with a sizeable crowd and free flowing wines and snacks. And although he claims that his short stay in Denmark and the visits to galleries and museums have had no influence on his work, it clearly does. 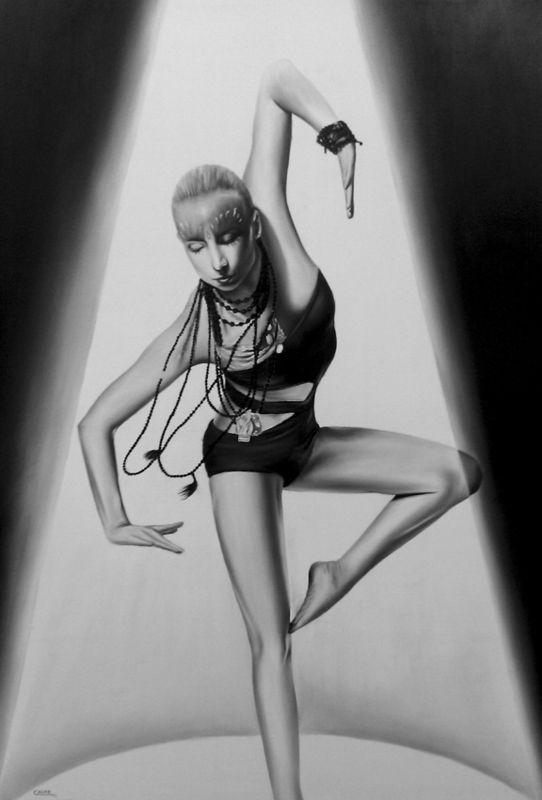 Some of the work features the dancers he would mingle with during his stay. His pallet too features gloomy colours in contrast to the vibrant hues he uses when in Zambia, whether this is due to the fact that he was there during a continuously overcast, and snowy Scandinavian winter, is up for speculation. During his stay the 26-year-old discovered that Europeans can be notoriously reclusive and that it was not easy to meet other artists, which again is not a surprise considering he did not go there on an organised, mainstream gallery residency or a not-so-social cultural exchange programme. “They are very private even the few artists that allowed me into their studios, it’s because they heard I’m from Africa. It’s not the way we operate in Zambia where we steal each other’s ideas in the studio. That side they can sue you,” he says “But from my short experience, they (Danish artists) are also good at sharing buyers not the way it is here where some artists will not even allow you to talk to their collector thinking that you will rob them of sales”. He observed that in Denmark, most artists create to express themselves and not necessarily to sell and put food on the table and that as such, they are free to come up with bold and sometimes provocative work. “So now I’ve been inspired to paint my ideas. Ideas should come first and money later because you know here tupentela indalama (we paint for money). Whenever you start a painting you have to think about who is going to buy it first, otherwise you will just paint it for yourself” he says. He also condemned artists whom he believed would go to Europe for short instances and return with what he described as “all sorts of funny ideas” in the effort to try and keep up with modern artistic trends. “I’ve seen a lot of Zambian artists who return from Europe and start sticking pieces of paper and all sorts of funny things like plastic and garbage into their work claiming this is 21st century art, but I won’t do that, its nonsense,” he boasts. While in Denmark, he was also fascinated by the fact that the country’s monarch Queen Margrethe II is in fact an artist. Although she is educated in prehistoric archeology, political science and economics, and has had no formal schooling in the arts, the queen held an exhibition of one hundred and thirty-five works in a show entitled The Essence of Colour during the celebration of her 40 year reign last year. But it is not only the fact that art is practiced in the higher echelons of Danish society that impressed Chisha, but also the immense media coverage that the field is given in the press. “That side they have serious art critics and journalists who are not afraid to criticize your work because they are afraid that you (the artist) will hate them and stop talking to them like here in Zambia. That side if your work is rubbish, they will tell you that its rubbish,” says Chisha. As much as the upcoming artist’s observation is valid, he might be a bit too inexperienced to understand the dynamics of art criticism in a small, emerging space like Zambia where a seriously critical article meant to construct rather than destroy can be easily misinterpreted. Zambian art critics such as Roy Kausa and this writer have somehow ended up creating unforgiving, mortal enemies from the lowest to the highest ranking circles of visual arts practice and administration in this country. Nevertheless, back to Chisha, his Danish escapade although a private affair, serves himself and Zambia well. Although one would have hoped for it to be more mainstream and organised, whichever way you look at it, he was flying the Zambian flag if not in his own little way, the Danish know we exist. Chisha remains one of the country’s most promising young painters with a deep imagination and matching creative aptitude as well as an exceptional painter’s hand. He is certainly one to watch, however, one can only hope that he ponders on applying his potential to an academic path while he is still young as this may further brush up his already sharp artistic wit. Of course not every artist has to go the academic route, but then we cannot all be Jean-Michel Basquiat, can we? For a couple of weeks now, five Livingstone based artists have literally taken over the Zebra Crossing Café at Ababa House in Lusaka in an exhibition “Cho! 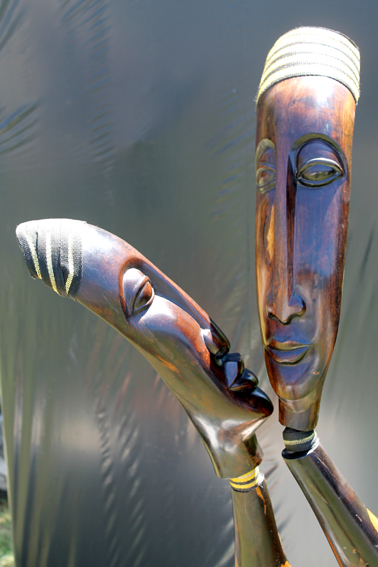 Chise”, the Bemba words that are used to call for the listeners’ attention, before telling a story. The show opened on the 7th of this month but as of last week Monday, was still suffering sluggish sales. Nevertheless, the small exhibition is important for two reasons: it reminds Lusaka dwellers that artists do exist outside the capital; and it also reminds us of Vincent Maonde whom at the age of 64 remains one of the country’s most influential artists having inspired many, including his son Alumedi who is also in the show. 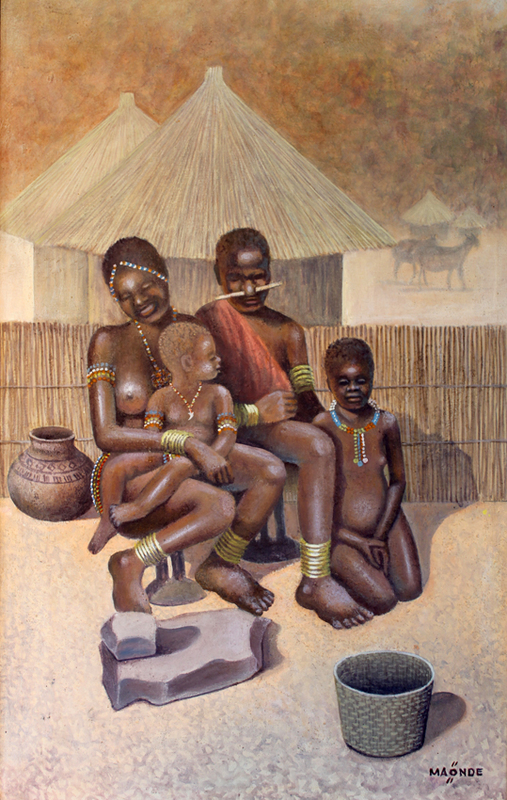 Although his paintings do not seem to shift from his idyllic rural narrative, which often depict women drawing water, cooking or doing other chores in scerene village backdrops, they still are quite refreshing depending on how they are read by the viewer because they are in any case timeless and can be placed in any period that extends from mythical times to post-colonial. But what is most enjoyable about Maonde is his matchless ability to use a colour range of fluffy pastel-softness even when he is working in oils. Since the 1970s, the Evelyn Hone College and Rage Gate School of Art & Design (London) trained artist has exhibited in Sweden, Canada, the UK and USA. His son Alumedi’s work on the other hand has progressed into abstraction over the past few years, his figures being reduced to geometric mask-like figures as can be seen in Camouflaged Identity, one of the few paintings that sold during the opening week. His work has become increasingly recognisable because of the consistency of his bright pallet, if not for the repetitive masks. Camouflaged Identity shows a not so camouflaged chameleon crawling down a twig. Speaking of chameleons, Alumedi’s is not the only one in the exhibition. The other comes in form of the multi-disciplinary, up-coming artist Suse Kasokote whose style is coming quite tricky to follow. It changes the way a chameleon changes its colours. 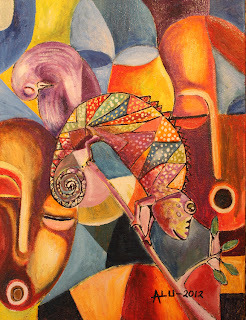 If you were able to catch up with his first solo exhibition that was held at Alliance Francaise in Lusaka last August and expect to find the same style exhibited there, you have another thing coming. In his uncanny submission of work Kasokota uses sand or soil as a medium, much like you would expect from a further up the ladder fellow Livingstone artist Chansa Chishimba, who surprisingly with Firoz Patel, Sylvia Mwando and James Zimba are not in the show. Anyhow, Kasakota is ever the entertainer; there is no telling what next is up his sleeve. 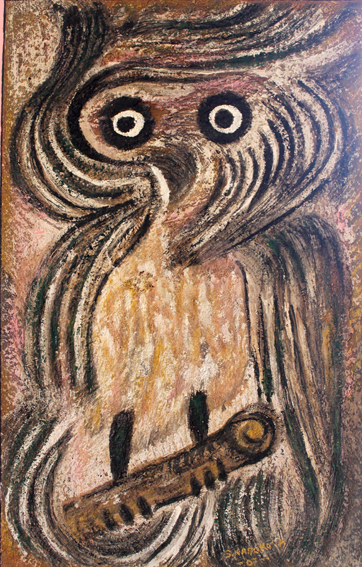 The artist who literally promised us that the sacred Nyaminyami (water spirit of the mighty Zambezi River) will help us co-host a successful UNWTO general assembly, always manages to border on the shadowy, which can be quite an exciting element in an artist; and his work Royal Fwifwi, the abstract image of an owl, a bird held in very high esteem in local mystical circles, is a typical example. 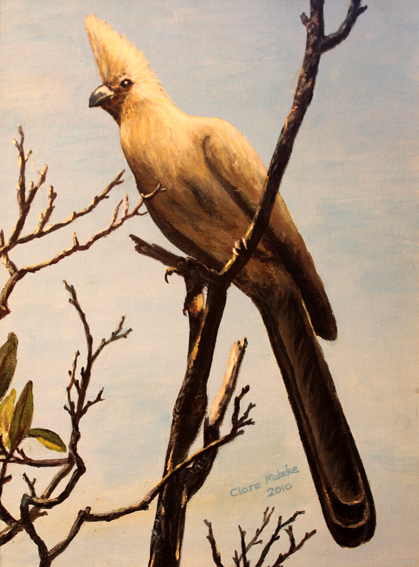 Clare Mateke provides the only feminine touch to the display and has about eight paintings of various animals, mostly birds on display, which is not surprizing at all because she is a professional mamalogist (studies mammals) at the Livingstone Museum. Much of her work at the museum involves preserving and documenting several species of Zambian wildlife; and clearly she has been quite busy outside her laboratory because she has developed her painting skills thoroughly. 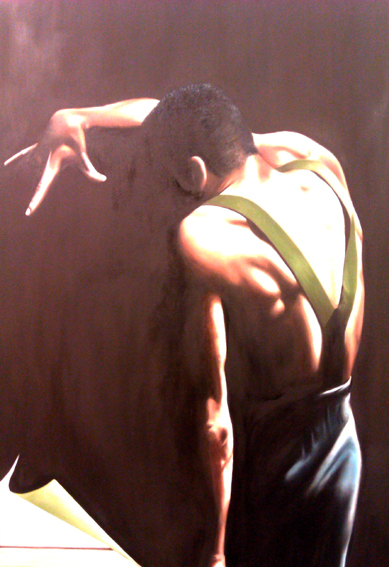 Last but not least in line is Thomas Kaoma who has a variety of abstract doodles as well as some realistic scenes on show. Interestingly, Kaoma is quite generous in the use of acrylic and uses it in very thick daubs which leave the water-based paint with a very strong oil-like gleam. He applies this technique to both his abstract and realistic work which almost immediately gives him an identity. Anyway, it is pleasant to see that not all Livingstone artists are hoarding their work for the over-hyped United Nations World Tourism Organisation (UNWTO) general assembly about four months from now, an event of which many artists speculate that streams of compulsive-shopping tourists will just stream out of their aircrafts and thoughtlessly whisk away every single art and craft in sight. Livingstone, nonetheless, has always had a vibrant contemporary art scene and artists have enjoyed a considerable amount of corporate support from the hospitality industry. One good example is the Zambezi Sun who during the period that art lover and former marketing and public relations manager Elizabeth Mwanza (one time Miss Zambia) launched Art In The Sun in 2008 a partnership that allowed different themes and artists to display and rotate work in the hotel’s lobby on a monthly basis. This partnership has obviously fallen off by now but it would be nice if both parties could consider reviving it. “The evolution of photography and the history of Zambia show some intriguing parallels, not only in their timelines but also in the way they reflect moments in world history, their paths crossing in extraordinary ways,” writes photographer and agriculturalist Peter Langmead in the introductory remarks of his recently published documentary photography book Postcards from Zambia. Dr Langmead, who studied photography before working in Nigeria making photographs, film and video for agricultural development projects, describes how a decade after David Livingstone became the first European to set eyes on Mosi-oa-Tunya (Victoria Falls) in 1855, European expeditionary photography took hold. Dr Langmead continues in part by stating that although Charles Livingstone was required photograph ‘characteristic specimens of different tribes’, this was difficult due to the lengthy exposure times of early photography and the lack of familiarity local people had with having their pictures taken. He explains that the first attempt to photograph Mosi-oa-Tunya was by adventurer James Chapman on an 1859-63 expedition but the attempt failed and that the mighty water falls only had its first photograph taken about 29 years later by William Ellerton Fry in 1892 as part of a Colonial Office survey and this was 37 years after Livingstone’s first sighting of the geographical feature. Nevertheless, Dr Langmead’s 7-page explanatory text is in itself a short, well researched and riveting colonial history lesson that also encompasses a brief history of photography from a technological standpoint. This is broken down into six, titled segments namely Discovery, Difference, Mass Tools, Theory and Practice, Globalism, Technology and Social Change and A New Photographic response. In the latter, Dr Langmead grapples with a debate that was also tackled by British photographer David Bate in his 2009 book Photography, The Key Concepts. As well intentioned and pious as Dr Langmead’s statement reads, flipping through the first few pages of the 77 or so black and white photographs under the title The People one cannot ignore the impression that some of the photos have the almost voyeuristic feeling of National Geographic-type exoticism towards none-western people. This can be seen in many ‘face-to-the-camera’ portraits that feature different aspects of rural life in Zambia. Typical is A working man, Mumbwa, which shows the wind-beaten and sun-dried face of a man who appears to be older than he may actually be but, the lines on his face show that hardships seem to have gotten the best of him. Then there is Licensed wild honey hunter, Itezhi-Tezhi, which shows a young man in front of a village hut proudly brandishing the K20 (twenty kwacha) cash sale receipt that will allow him to collect honey for two weeks. A rice grower and his son in Lambwe Chomba, shows an elderly man in an oversized shirt standing in a field with a youth by his side, both face the camera in poses that make them look ridiculous if one was to be frank. Clearing a bit of forest for his farm, is the portrait of a weathered elderly man in a tattered baseball cap, soiled shirt and tattered pinstripe jacket. Looking at these images, which are just a few among many, one finds it difficult to describe the subjects as dignified participants in their “own increasingly successful economic environment.” Almost to the contrary, the photographer tries to capture and encapsulated in his subjects some sort of primitiveness. But perhaps these are reasonably inconsequential details and to a great extent matters of individual interpretation. It would be interesting, however, to see the reaction to this book from the rapidly increasing Café-type urban Zambians who are likely to have easier acces to it but to a large degree seem to have been left out. Certainly one of the most welcome aspects of the book is Dr Langmead’s commitment to the documentation of excessive deforestation due to charcoal burning. He dedicates about twelve pages including the cover to it. Charcoal: livelihoods or deforestation? Is a portrait that speaks volumes, it shows an evidently well-sustained rural woman (not in tatters) standing in front of her trading depot with dozens of charcoal sacks fading into the background. This is followed by Depleted Miombo Forest and An executioner cuts down the tree, all of which speak for themselves. Anyhow, there is a great deal to admire in the book, not least its effortless ability to seamlessly sweep across rural Zambia from Samfya to Mumbwa, from Itezhi-Tezhi to Chipata and so on. As a coffee table book, the 17cm x 17cm publication is likely to give city dwelling Zambians as well as foreign tourists a deeper glance at Zambia as they peruse through its 95 pages. “In addition to targeting a local readership, Postcards from Zambia also provides a snapshot of life in Zambia for those less familiar with the country, whether tourists, business visitors or overseas observers. As such, it makes an ideal platform to showcase the country for the United Nation World Tourism Organisation (UNWTO) General Assembly in August,” reads the electronic press release in part. And the brief text on the back reads “This collection of photographs reflects aspects of life and society in Zambia with the aim of inspiring current and future generations of documentary photographers”. 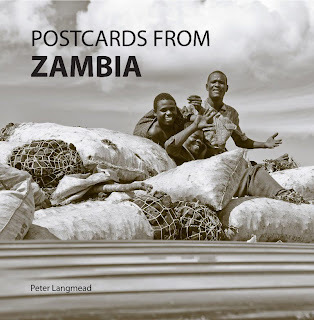 Postcards from Zambia is published by Langmead & Baker Ltd, it is now available in leading bookstores around Zambia and can be purchased in the United Kingdom at www.amozon.co.uk. Dr Langmead has also spent time in South East Asia and later studied for a PhD in finance. By 1993 he had obtained a farm in Zambia where he returned after his Asian excursion as a business development consultant.